How often do you feel like a referee between projects competing for human resources? Do you get worn down by the constant tug-of-war? Are you training your project managers to identify and use the resources of the organization to lead successful projects? Are you providing the processes and tools to get the right skills on the right projects? If not, your struggles will continue, and may even worsen. Here are three tips for improving the way your organization allocates, supervises, and shares its human resources. 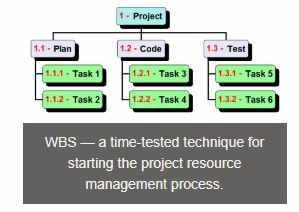 WBS — a time-tested technique for starting the project resource management process. 1. Right size and right skill your projects. Coach your project managers in good practice techniques as they organize and staff their projects. Encourage them to use time-tested tools such as the work breakdown structure and the resource breakdown structure to align the statement of work, work packages, activities, and required skill sets. With these in hand, the PM can specify the skills, experience and time required for the project. It’s the organization’s responsibility to ensure the functional managers match resources to the requirements. 2. Hold the functional managers accountable. Too often, resource commitments to the project manager are not honored. Sometimes, a resource reports to the project without the required skills and experience, or even worse, is overcommitted and can’t deliver on time. Another dropped commitment is in the area of performance management. Ensure the functional manager is responsible for how the resource is performing. Don’t allow your functional managers to do “drive by” allocating by dropping off the resource then driving away. Keep them engaged in assisting the PM in managing productivity. 3. Prioritize your projects based on resource availability. Help your PMs benefit from the concept of sharing resources without running into the downsides: lost productivity, frustration, low motivation, and constraints that can lead to schedule delays. Teach your PMs how to generate a resource plan that ensures no resource is underutilized or over committed. Have a system that makes resource availability visible across the organization.